This is our custom-built TRS to TRS balanced line cable (TRS is 1/4" stereo or balanced connector). Construction is Neutrik TRS connectors with Mogami 2552 cable. Neutrik connectors are some of the best connectors around. Mogami wire is the best wire, used in the best studios for its ultimate sound qualities and durability. 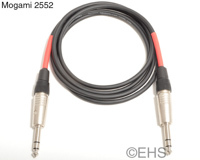 Mogami 2552 cable is very flexible, durable, light-weight cable. If you are looking for something a bit heavier, you might consider the 2549 cables. Photo 1 shows 6' cable with a red color label. Photo 2 shows the two ends with nickel-silver straight connectors and red color label.